Introduction: The management of paraesophageal hernia in patients undergoing bariatric surgery is controversial. Previously, treatment options have included performance of the procedures either in separate sequential operations, or concurrent performance of cruroplasty with either Roux-en Y gastric bypass or placement of an adjustable gastric band. We report our experience with simultaneous performance of cruroplasty and sleeve gastrectomy. Methods: Four female bariatric surgical patients, aged 43 to 68, with type III paraesophageal hernia, underwent laparoscopic hernia reduction, cruroplasty, biosynthetic mesh reinforcement, and concurrent sleeve gastrectomy. Mean operative time was 2 hrs and 35 minutes. The patients were followed up to one year post-operatively for reflux symptoms, resolution of comorbidities, and weight loss. Results: There were no post-operative complications. The mean average hospital stay was 2.25 days.The mean average weight loss following surgery was 22 lbs at 3 weeks and 44 lbs at 5 weeks. The average estimated excess body weight loss at six months was 30%. Most comorbidities improved or resolved and three patients reported complete resolution of reflux symptoms. One patient reported mild reflux with overeating, which was relieved with a proton pump inhibitor. 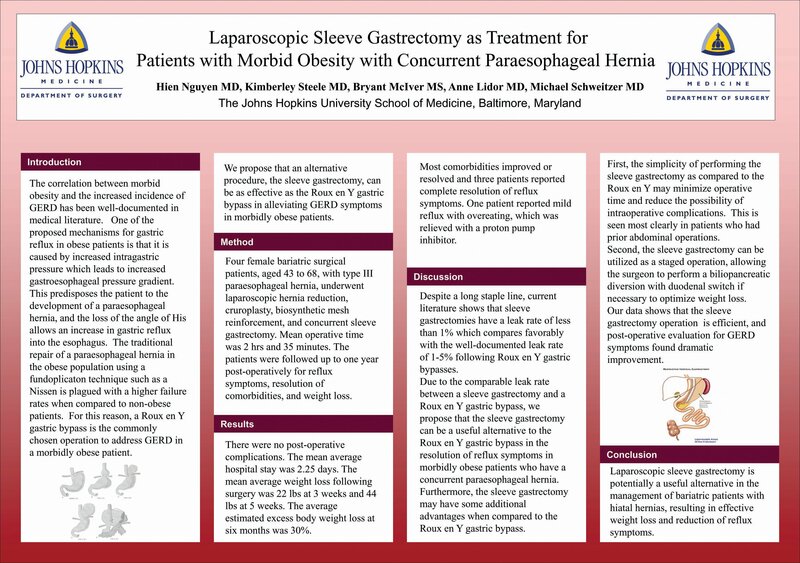 Conclusion: Laparoscopic sleeve gastrectomy is potentially a useful alternative in the management of bariatric patients with hiatal hernias, resulting in effective weight loss and reduction of reflux symptoms.